Mens Moto Jeans Distressed Grey. You’ll feel young, wild and free in these mens moto jeans with biker-denim details. Dark grey jeans combine faux leather and metal accents for an urban look. 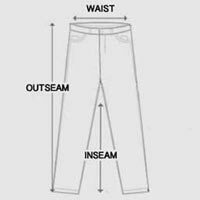 Skinny jeans constructed with button-up fly, belt loops and front and back pockets. Mens moto jeans include inner ankle zippers and zipper detail on both knees. Denim fabric made from cotton blend with slight stretch and faded wash. Biker jeans designed with black, faux leather panels on thighs with quilted detail. Express yourself in denim with a rugged attitude in these mens moto jeans. Model is wearing size 31. Sizes are measured in inches. For accurate measurements, check the table below.